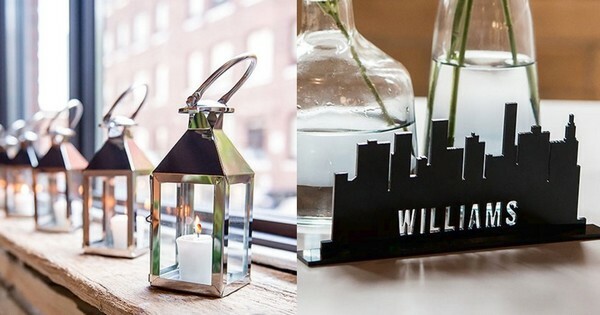 Shop bold, trendy wedding decorations, favors, and gifts for your industrial chic theme wedding ceremony and reception. Rugged meets feminine with contemporary designs featuring concrete, copper, galvanized tin, and more industrial metal tones and shades. Concrete decorations and favors offer a bold, rugged texture with a subtle feminine touch to create beautiful backdrops to table decorations for an industrial or metro wedding reception. Copper accented decorations and favors offer a deep, warm glow that is appealing to the eye and blends will with many earth tone and industrial color schemes. Copper plated flasks and beer tankards turn ordinary wedding party gifts for bridesmaids and groomsmen into a personal gift that also compliments your wedding theme. Galvanized tin also presents a more rustic or industrial look to a warehouse or industrial wedding ceremony or reception venue. Galvanized tins, planters, buckets, and favor boxes make unique decoration pieces for garden, and country weddings as well.